This is not entirely true, if you use a trusted teeth whitening product. It will not ruin your teeth, as those products essentially have active ingredients called Carbamide or Hydrogen Peroxide. Hydrogen peroxide is a bleaching agent that enters in a chemical reaction and converted to water and oxygen and of course these elements are very usual in our life and essential to the human body. The nature of teeth under microscope is rough with small projections on the surface. Oxygen molecules penetrate the surface of the teeth and expel all the stained spots. It’s very similar to what you see in TV shows where oxygen in the cloth washing powder removes all the stains from clothes once it touches the stains. Some of the other the teeth whitening gels used at home contain ammonia or depend on the acid for bleaching the teeth. In fact, most of the teeth whitening at home remedies depend on the acid in some fruits or vegetables. The carbamide peroxide teeth whitening depends on the cleaning effect of the oxygen. The acid-based bleachers may ruin your enamel. Harmless orange and lemon juices are very acidic (low PH levels) and this acid will harm the enamel. On the other hand, carbamide peroxide teeth whitening gels based have neutral PH or very slightly low PH levels. Carbamide peroxide based teeth whitening gels will not harm your enamel if used properly. Myth# 6: The whitening gels made in USA, Germany, Australia or UK are different. This totally wrong! You may think that if you buy an American or Australian brand of whitening gel, the quality of it will increase due to the reputation of these brands, but the truth is, the most of these products have the same main ingredients. Chemicals are chemicals no matter where you produce them. Carbamdide peroxide can be different in different parts of the world. The fact is, all over the world, the market is full of brands of teeth whitening gels and customer get confused about what brand to trust . The fact is, the main blocks of ingredients are THE SAME, as the carbamide peroxide (the active ingredient) is the same everywhere. Also there is no worry if you buy an expired whitening gel, as the gel would be already oxidized – gone flat and is not effective any more. So, it is not harmful but it will just not whiten. It will convert to a milky white substance that is harmless. Here is what you need to worry about. Are these gels manufactured by real dental labs? What is the concentration of the gel that you are buying? Has this brand been around for a while and can your questions be answered. Very popular teeth whitening kit for individual users. Comes with everything you need, in an attractive retail box. Presented in an attractive retail box, a great gift idea. All gels are manufactured fresh by dental labs, and the expiration dates are written in the instruction sheets. As a very widely know fact, people with sensitive teeth have a difficult life living with them. Some even call it a general nightmare. The pain and discomfort because of sensitive teeth will make consuming foods and drinks a bad experience. There are some treatments for sensitive teeth, but not all treatments will work for every body. While looking for a treatment, it may be best to get to know yourself better and reduce the discomfort. Now, just because you have sensitive teeth, doesn’t mean that you can’t look great, because there are ways for teeth whitening for sensitive teeth. 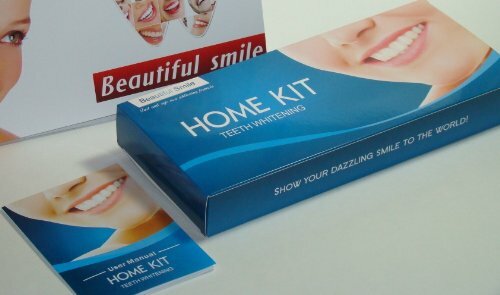 Knowing the importance of a great smile, everyone is looking for the best at home teeth whitening kit. Looking further into the caused of teeth sensitivity occurring after drinking something cold or hot and / or eating something hot or cold, or breathing even breathing cold air. None of the advise that you read can take the place of an actual doctor. So, if you have a lot of pain – something that you can’t bear – you will need to see your dentist. Because the pain comes from the nerve of your tooth, which might have been exposed. Under normal circumstances, teeth sensitivity occurs when your gums start to pull away from your teeth. Think of the gums as a protective layer (in addition to support), their job is to cover and hold the roots of your teeth. As the gums pull away, the roots will have less protection, and now they will start to be exposed. This exposure and the small tubules in the roots, are a direct way to the nerve of the tooth. All the pain elements such as hot, cold, pressure will travel down the tubules and will hit your nerves. This is the essential fact for sensitive teeth. If you don’t have sensitive teeth, it means, your gums do not allow the pain factors travel down to your nerve. It will be easier to find the best at home teeth whitening kit for you. In order to understand teeth whitening for sensitive teeth, we had to understand the reasons behind it. Now, when you do teeth whitening with a teeth whitening agent such as carbamide peroxide teeth whitening, there is a possibility that you will be opening the tubules temporarily. Right after you whiten your teeth, the tubules will be cleaned from stains and other factors leaving you more sensitive. First of all, it is important to note that, consuming staining foods and drinks such as coffee and tea immediately after teeth whitening will fill those tubules with more stains. You should refrain from consuming such foods and drinks. A period of 24-48 hours of waiting is suggested. The other disadvantage of consuming these foods and drinks will be the pain factor. The basic element of teeth whitening for sensitive teeth is to be careful and aware. There is an article about sensitive teeth whitening tips, it will help to read those tips and reduce the sensitivity. It will help to decide on the best at home teeth whitening kit for yourself. While teeth whitening for sensitive teeth, the main point is to eliminate teeth sensitivity and keep your gums strong / healthy. One of the hidden elements of increased sensitivity is the brushing technique. Using a lot of force will hurt your gums and keep the teeth tubules exposed. High quality electric tooth-brushes like such as the Sonicare advanced may help. An electric tooth brush with a whitening toothpaste may not be the best at home teeth whitening kit, but it could be a start. Experts on teeth whitening for sensitive teeth widely acknowledge that there are several tooth-pastes with potassium nitrate, which will help to reduce the pain temporally. Sensodyne is one of the leading brands. The fix temporary like taking a pain killer for your teeth. Mouthwash with fluoride such as Scope may also help. There are many others to choose from but everyone knows Listerine burns even with no teeth whitening for sensitive teeth. Some whitening systems claim to be gentle but they usually do not deliver good results. If you are looking for ways to teeth whitening for sensitive teeth, you will need to consider the underlying reasons for sensitive teeth. If you can eliminate, you should, if you can not eliminate, then you will need to look into reducing or at least living with it. If you have gentle – sensitive teeth and you still want to whiten your teeth, you should use extra caution. If everyone is doing 30 minute whitening sessions, you should do only 10-12 minutes or even less. If they do it every day, you should do a whitening treatment twice a week. In a way, you should customize your own best at home teeth whitening kit procedure. After the whitening, you can stay away from the usual suspects such as hot beverages and cold drinks. You can also make it a regular habit of using re-mineralization gels after each teeth whitening, as stated in the article for sensitive teeth whitening tips. It is important to read about teeth whitening for sensitive teeth for start whitening.